Kelli Branton came to AALOS after working 19 yrs in the Customer service Industry. 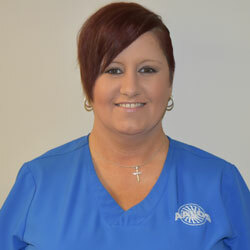 With her experience in customer service, our patients are always greeted with a friendly face. Not only is Kelli the first person our patients encounter when they enter our office, but she is also the direct link to our Referring Physicians and other Allied Health Service Professionals. In her free time, Kelli enjoys spending time with her family, five fur babies, and especially helping to take care her 9 year old niece, Mallory.